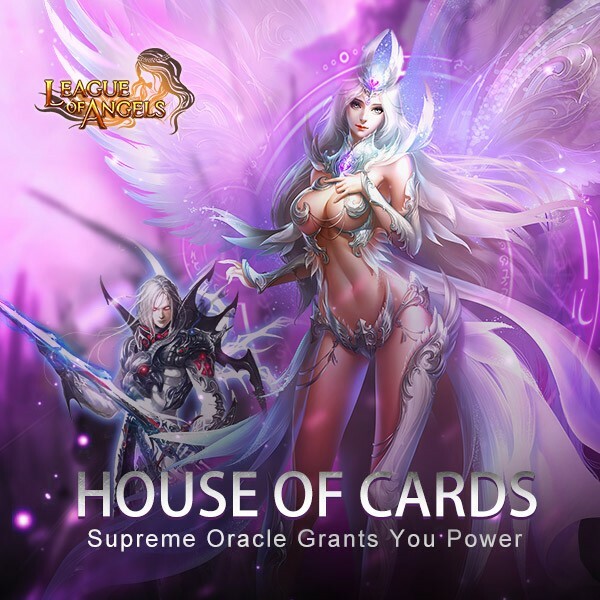 House of Cards: Supreme Oracle Grants You Power! - You can swap the required cards for: Supreme Oracle, Lapsed Eragon, Messenger of Darkness, Light Envoy, Moonlight Warlord, Hercules, Earthshaker, Flaming Warlord, Dragon Whisperer, Yasi Delaney, Amazon Hawker, Son of Odin, Mountain God, Amazon Hunter, Blazing Hecate, Hecate, lvl.11 agility+hit, lvl.11 agility+hit, lvl.11 agility+hit, Lvl 10 PATK+Dodge, Lvl 10 MATK+Dodge, Lvl 10 Crit+Hit, Lvl.8 Dodge+Hit Gem, Lvl.8 PATK+HP, Lvl.8 Crit+Hit Gem, Blessed Stone, Elemental scroll, Magic Socketing Rod, Spring Of Wisdom, and many more! - Total Ranking Rewards: At the end of the event, the Top 20 players with at least 40,000 total points have a chance to win Joker L, Lvl. 8/7/6 Fusion Gem Chests, Runestone. Description: Continuously draw 10 Cards certain times during the whole event to get Flashy Cards and Joker (S)! Description: Reach following requirements to swap for more scarce Flashy Cards! Description: Single Recharge certain amount to get extra rewards like King of Heart, Ace of Heart, Card Lotto Voucher, Flashy Ace of Hearts, and Joker (S). Description: Consume certain amount to get extra rewards like King of Heart, Ace of Heart, Card Lotto Voucher, Hero's Mark, and Joker (S). Description: Recharge during the event to get special rewards! More exciting events are coming up through Aug 30 to Sep 2 (Server Time), check them out in the in-game Hot Events menu now! Last: Capsule Toys: Silver Dragon Lord Awaits You! Next: Enjoy Loralei's Wardrobe and Event Bonus!